Digital marketing is an absolute passion of ours. Not because it’s entertaining, or pretty, or even fun (although we think so!) There is one fundamental aspect of digital marketing that draws us in, and leaves us with a feeling of accomplishment every day… and that is that Digital Marketing works. To be more specific, SEO in South Africa works. However, with so many people having so many different ways of approaching digital, it’s easy for the subject matter to get diluted, confusing, and as interwoven as the web itself. If this happens, you may find yourself at a loss for the what’s, how’s and why’s, leaving your agency to just ‘get on with it.’ And although we absolutely believe that the experts should be left to do just that, it’s also just as important for you, the client, to at least have a broad understanding of what your agency is going to accomplish with SEO. This is an ongoing series that will look at some of the digital disciplines often used in digital marketing, and will have a specific focus on educating business owners, brand managers and marketing specialists in South Africa on what they should be getting from their agencies, as well as some questions that will better empower you to understand the role that these disciplines should have in your broader digital strategy. Search Engine Optimisation is a term that has been passed around the industry for the better part of a decade. Every agency has a different interpretation of SEO in South Africa, and apply various avenues of thought when optimising a website. However, there are fundamentals that need to be applied in order for your website to carry a greater appeal to search engines than your competitors. In a nutshell, SEO is a combination of technical know-how and logical application of customer insight. When you search Google for SEO in South Africa, it applies over 200 factors when carrying out a search of millions of pages, in fractions of a second. There are two areas that Google looks at: The user, and the destination page that contains the information you are looking for. The search engine takes into consideration your location, the device you are using, your previous search history and the speed at which you are connected to the internet. Google wants to ensure that all the results you are presented with are relevant, virus free and easy to access. Google and search engines alike have HUGE data storage centres where they keep a log of every website they index, along with snippets of what information written words are on that specific website. Google sends digital spiders to crawl your site, read the information that is on there, and store it in their data centres. When a term is searched, they scan their databases and bring up the most relevant pages for that particular search phrase in near real-time application. There are 61,673 Google searches in 1 second. Visit this page to view more live stats on Google’s Search / SEO! As you have probably noticed in your own searching experiences, there is a strong link between the results displayed and the search phrases that the user typed in- this correlation comes down to your content, and how specific you can get it. Your digital agency needs to provide you with optimal keywords that relate directly to your product and/or service offering. These keywords and phrases need to be included in your content and meta data, with an overlay of customer data. Now, there is the perception that more = better. 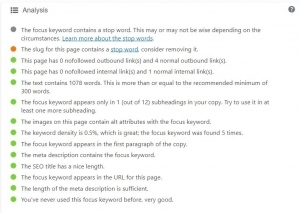 But implementing the term SEO in South Africa multiple times unnecessarily into one piece of content will do more harm than good, as Google considers this “keyword stuffing”. There needs to be a balance between readable content and the inclusion of targeted keywords. You’ve heard it all before- create content that your users want to read, rather than what you want to write about. This is the basis for content marketing, and SEO plays an imperative role in this digital marketing relationship. Your keyword: Every Blog post must have a keyword. Just a few words that are relevant to your article, and that a user may be prone to search for. As the client, there are questions that you should be asking your agency. Agencies should be optimising for Once-Off, which are fundamental elements that Search Engines look for. Secondly, there’s Ongoing, which focuses on blog content and monthly reporting. Has SEO been explained to you? Have you received the keyword research and audience analysis? Have you checked your site’s speed on Google Page Test? Have you checked your site’s mobile responsiveness on Google’s Mobile Friendly Test? Does your Blog have Google Tracking code Installed? 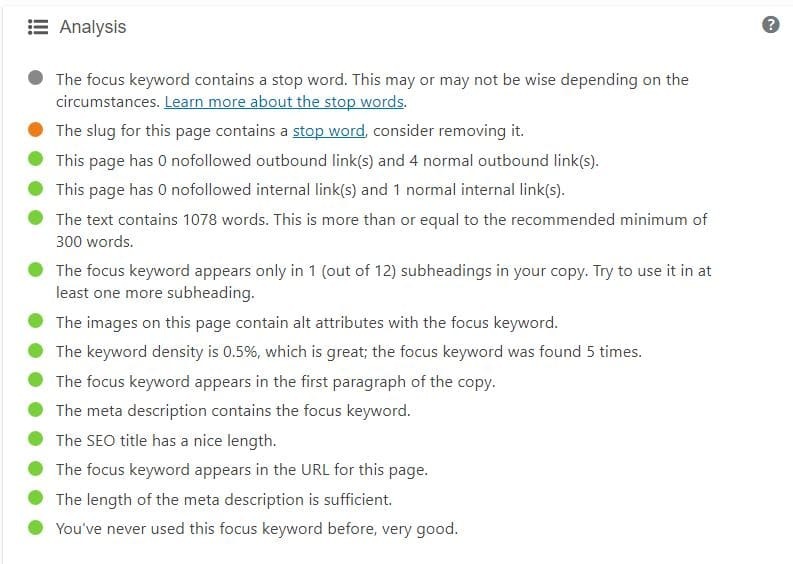 Are Blog posts published with a Green Light on your SEO checker? Do you have a monthly keyword plan, that aligns with your website’s keywords? Have you set specific metrics for ongoing reporting, such as keyword ranking, conversion rates, and impressions? Are you being provided with a monthly report that showcases how your website and/ or blog is performing? If you’re still not 100% sure of what you’re looking at, make use of some amazing free tools available online! Run your site through https://seositecheckup.com/ for a full report on how your website stacks up. Looking for specialists in SEO in South Africa? Visit us to discuss your SEO strategy.